Stop in and visit our newly expanded floral department. We carry a large selection of premium cut flowers. Let us design the perfect arrangement or pick out what you like for a custom made bouquet. We specialize in floral arrangements for every occasion. Choose from a beautiful vase of flowers, artfully designed arrangements in ceramic or basket, dish garden or bouquet. We have pre-made items in our cooler or custom design an arrangement with the help of one of our floral experts. Select any number of flowers and have one of our florists add their special touch with a combination of greenery and baby’s breath for a custom made bouquet. 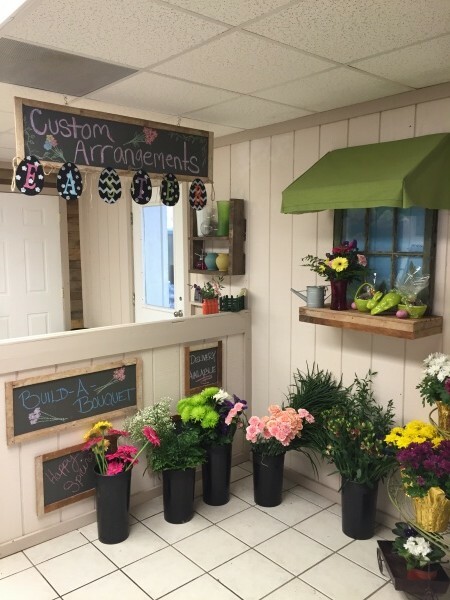 We carry a large selection of fresh cut flowers to choose from. We customize arrangements for all occasions. Think of us for birthdays, anniversaries, Mother’s Day, Easter, Valentine’s Day, or just thinking of you. We design small to medium size arrangements for the gravesite. We have custom made memorial wreaths available year round. For your convince, we deliver 7 days a week.